The Clorox disinfecting wipes were great for quick times when we needed to prevent the spread of germs. They were not a useful cleaning wipe for larger or messier cleaning jobs. This product would be great for use when you have sick people around, or for routine maintenance around the home. For jobs where you need to scrub or absorb a lot of liquid, these wipes may not be the best choice. Comes in several scents including Fresh, Orange and Lemon. All the scents are light and not overpowering. When used properly, kills staph and salmonella on surfaces. Be sure to allow the surface to stay wet for at least 30 seconds. Convenient all-in-one design. There aren't any moving parts to worry about. Although threading the first wipe through the lid did cause a little trouble. Wipes are very thin and can't really be used as a cleaning wipe, for scrubbing or used to absorb any liquid. Should not be used on unpainted wood. This would cause warping and damage to the surface. Surfaces that may come in contact with food should be rinsed well. 35 wipes come in a container, although larger containers are also available. The wipes kill several types of bacteria in 30 seconds. 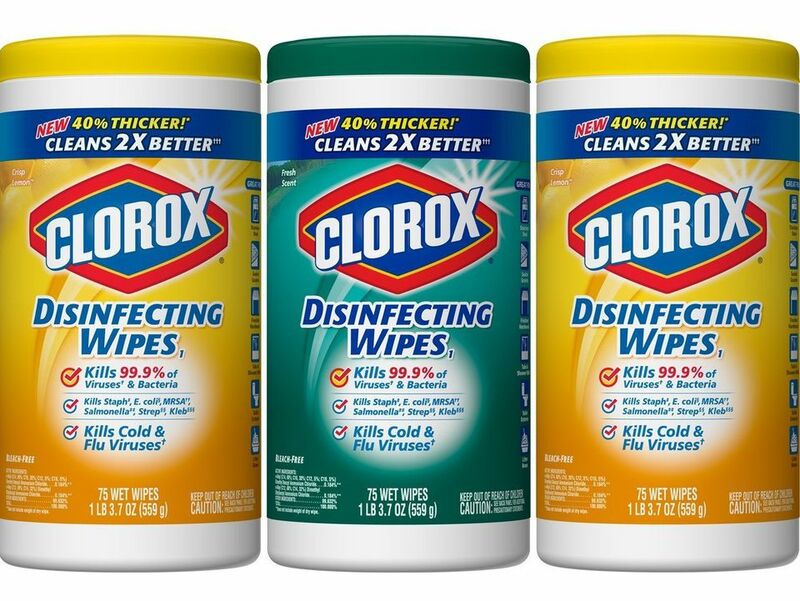 Clorox Disinfecting Wipes do not contain chlorine bleach, which makes them less likely to damage surfaces. The disinfecting wipes made a great standby for when we needed to quickly disinfect a surface. During a stomach flu epidemic, it was convenient to wipe down doorknobs, toys, and my cell phone quickly and often. We kept some on hand to disinfect shopping carts during grocery trips. The product is designed to be safe for most surfaces with a pleasant smell in all of its varieties. Safe on many surfaces including acrylic, fiberglass, vinyl, painted wood, synthetic and wood laminate, stainless steel, aluminum, glazed tile, painted drywall, and enamel. Due to the variety of surfaces it is safe for, the product helps clean up and disinfect most surfaces in your home. The disinfecting wipes aren't very effective for cleaning any surface that is more than lightly soiled because of the thinness of the actual wipe. If you have a spill to clean up, you'll need something else. If the surface needs to be scrubbed, the wipe will likely disintegrate as you try to scrub. Choose a cleaning sponge or dish scrubber instead. Only 35 wipes come in a regular-sized container, so depending on use, running out of the product could become a factor. To disinfect make sure you allow the surface to stay visibly wet for 5 minutes before surface drying. For nonporous surfaces, allow to be visibly wet for 30 seconds. Do not use on unpainted wood.